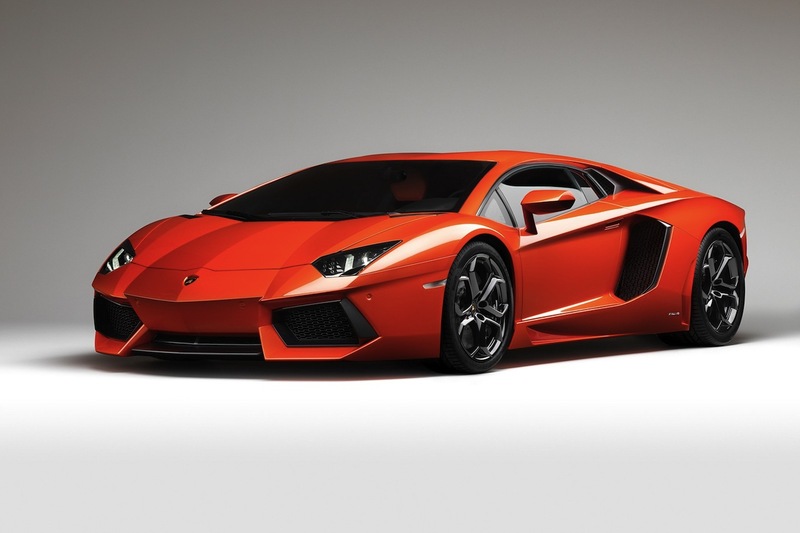 The upcoming 2012 Lamborghini Aventador LP700-4 is one sinister-looking Italian raging bull. It goes on sale later this summer with a base MSRP of $379,700 (you know – $380,000 just sounded too high). The bad news is that all the existing production for the next 18 months has already been spoken for. The technology package of the Lamborghini Aventador LP 700-4 is utterly unique. It is based on an innovative monocoque made from carbon-fiber that combines exceptional lightweight engineering with the highest levels of stiffness and safety. The new twelve-cylinder with 6.5 liters’ displacement and 515 kW / 700 hp brings together the ultimate in high-revving pleasure with astonishing low-end torque. Thanks to a dry weight of only 1,575 kilograms (3,472 lb), which is extremely low for this class of vehicle, the weight-to-power ratio stands at only 2.25 kilograms per hp (4.96 lb/hp). Even the fantastic 0-100 km/h (0-62 mph) acceleration figure of just 2.9 seconds and the top speed of 350 km/h (217 mph) do not fully describe the Aventador’s extreme performance. And yet, fuel consumption and CO2 emissions are down by around 20 percent compared with its predecessor, despite the considerable increase in power (+8%). For Lamborghini, design is always the beauty of aggressive power, the elegance of breathtaking dynamics. From the very first glance, the new Aventador is unmistakably a Lamborghini, clothed in the brand’s characteristic and distinctive design language – with its extremely powerful proportions, its exact lines and precise surfaces, and with taut muscularity in every one of its details. The designers in the Centro Stile Lamborghini have carefully developed this design language to give the Aventador a significant new edge. It is an avantgarde work of art, an incredibly dynamic sculpture, from the sharply honed front end through the extremely low roofline to the distinctive rear diffuser. Every line has a clear function, every form is dictated by its need for speed, yet the overall look is nothing less than spectacular and breathtaking. Truly impressive proportions come from an overall length of 4,78 meters (188.19 in.) matched with an impressive width of 2,26 meters (88.98 in.) including the exterior mirrors, and further accentuated by an extremely low height of just 1.136 mm (44.72 in.). It goes without saying that both doors of the carbon-fiber monocoque open upward – a feature that was first introduced in the now legendary Countach and then used for subsequent V12 models such as Diablo and Murciélago. However, the Aventador also evokes its immediate predecessor the Murciélago – electronically managed air intakes open depending on the outdoor temperature and the need for cooling air,ensuring maximum aerodynamic efficiency. And for those whishing to flaunt the heart of their Lamborghini, the optional transparent engine bonnet exhibits the twelve-cylinder engine like a technical work of art in a display case. The new Lamborghini flagship has a full monocoque. The entire occupant cell, with tub and roof, is one single physical component. This ensures extreme rigidity and thus outstanding driving precision, as well as an extremely high level of passive safety for the driver and his passenger. The entire monocoque weighs only 147.5 kilograms (325.18 lb). The monocoque, together with the front and rear Aluminium frames, features an impressive combination of extreme torsional stiffness of 35,000 Newton meters per degree and weighs only 229.5 kilograms (505.9 lb). Engineers at Lamborghini have created the perfect mate for the new twelve-cylinder engine with the highly innovative ISR (Independent Shifting Rods) transmission. The development objective was clearly formulated – to build not only the fastest robotized gearbox, but also to create the world’s most emotional gear shift. Compared with a dual-clutch transmission, not only is the ISR gearbox much lighter, it also has smaller dimensions than a conventional manual unit – both key elements in the field of lightweight engineering for super sports cars. This kind of extreme power must be delivered reliably to the road. The driver of the Aventador LP 700-4 can depend fully on its permanent all-wheel drive – indicated by the 4 in the model designation. In the driveline, an electronically controlled Haldex coupling distributes the forces between front and rear. In a matter of milliseconds, this coupling adapts the force distribution to match the dynamic situation. A self-blocking rear differential together with a front differential electronically controlled by ESP make for even more dynamic handling. The Drive Select Mode System enables the driver to choose vehicle characteristics (engine, transmission, differential, steering and dynamic control) from three settings – Strada (road), Sport and Corsa (track) – to suit his individual preferences. In the hands of its driver, the Lamborghini Aventador LP 700-4 is a high-precision machine – spontaneous, direct and always reliable. The driver is also assisted by the latest electronic systems such as the incredibly sporty, adjustable ESP system. When it comes to passive safety, front, head-thorax and knee airbags play their part alongside the extremely stiff carbon-fiber cell. A Lamborghini should always fit perfectly with the style and preferences of its owner. To this end, the range of individualization options is virtually inexhaustible. There is a selection of 13 production paint colors to choose from, three of which are highly sophisticated matt tones. A choice of two-tone interiors are offered with the “Sportivo” and “Elegante” versions, while a premium audio system and reversing camera are among the many technology options. And of course, the “Ad Personam” individualization program knows no limits when it comes to colors and materials.